Vacation rentals have become a hot topic in Carlsbad real estate circles. In a surprise move, the Carlsbad City Council recently banned them–at least for all properties east of El Camino Real as well as certain areas in the Village and around the lagoon. Little regard was given by City Council to existing rental contracts, airline reservations made by tourists coming to Carlsbad or owner property rights where there are no CCR’s and Homeowner Associations limiting property use. It’s a ruling that could land the City of Carlsbad in the courts. This recent ruling has been a blow to many Carlsbad real estate investors, many of whom poured retirement savings into properties such as the La Costa Chateaus, which have always served as vacation getaways and ideal vacation rentals for individuals or couples seeking a La Costa vacation. Moreover, CCR’s for the Chateaus have always allowed for vacation rentals and have never disallowed them. are far from any residential neighborhoods. The residents and vacationers tend to be the quiet sort, with most noise coming from the resort itself–as with the most recent Memorial Weekend Jazz Festival, where shuttle buses park right in front of the buildings. 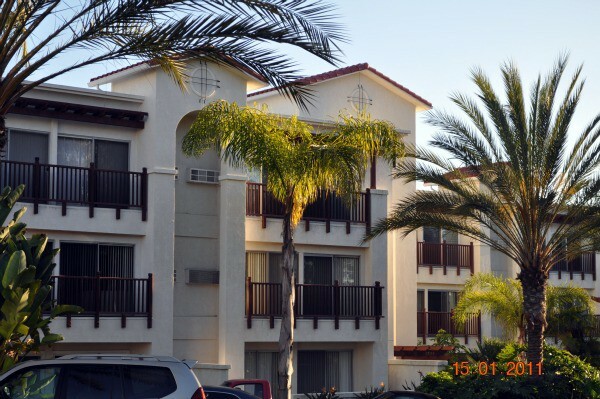 These two buildings at 2003 and 2005 Costa Del Mar have served as short term residences for as long as anyone can remember–and many of these 791-square foot condos have been turned into vacation rentals over the years. No one with Carlsbad City Council has yet responded to any of the numerous letters La Costa Chateau owners have written to the Council, Mayor and City Manager–though they promised to do so in a recent San Diego Union Tribune article by Phil Diehl. A Theft of Personal Property? The second reason for city staff’s multiple recommendations to exempt the Buildings from Ordinance No. CS-272 is that, given these facts, applying Ordinance No. CS-272 to the Buildings amounts to a regulatory taking for which the city must compensate the owners in the Buildings. I am neither an attorney nor an accountant, but I see damage to ALL Chateau homeowners if the value of their units goes down in value because of this municipal interference. Additionally, there is the serious loss of income that results from both the threat of this regulation and its ultimate enforcement. Already, guests are beginning to question bookings they have made for later in the year and 2016–and are asking if they should look elsewhere. It appears damage is already occurring, and many owners are looking to the City of Carlsbad to “stop the bleeding” before it gets any worse. One of five key principles, for a free and prosperous society, are the rights to own and enjoy property. When governments infringe on how owners enjoy their property, they infringe on the ownership of it. We know that property ownership produces better protection, care and value of property. To infringe on those rights is to promote the eventual decay of property. In the meantime, owners of some Carlsbad vacation rentals–and the La Costa Chateaus in particular–are awaiting word and reversal or modification of Ordinance No. CS-272. It is this ordinance that has property owners and rights activists up in arms. *Disclosure: We own three units in the La Costa Chateaus which have for years been vacation rentals.